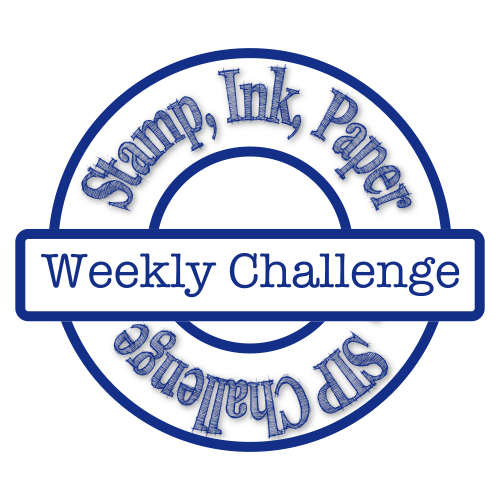 Hey there, welcome to our final Stamp Ink Paper challenge this year! 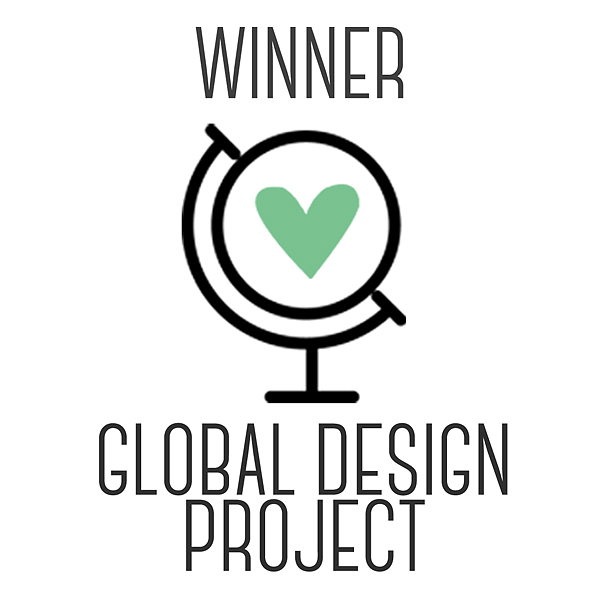 Long time no blog!! Have you recovered from the holidays yet?? We had a quiet Christmas to ourselves! The kids made out like bandits with clothes! 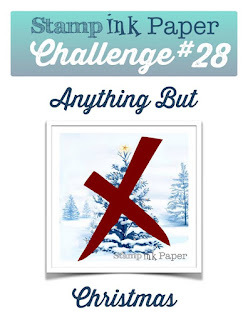 I honestly could not wait to make something NOT Christmas themed, and basically had no rules with our challenge this week. 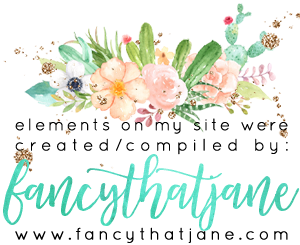 I am very excited about the Stampin' Up! Occasions catalog... By far one of the best in a long time! Watermelon Wonder ribbon around the layer and adhered it to the back of the Very Vanilla with Liquid Multipurpose glue.I set this layer aside after making my lovely bow! The Rose was cut using our new Precision Plate. This too was Watermelon Wonder card stock. To give the rose some dimension I heat embossed it twice with Clear Stampin' Emboss powder. The two way glue pen seemed to be the smartest way to adhere this to my Very Vanilla circle (I used our Circle Framelit Collection to cut this). 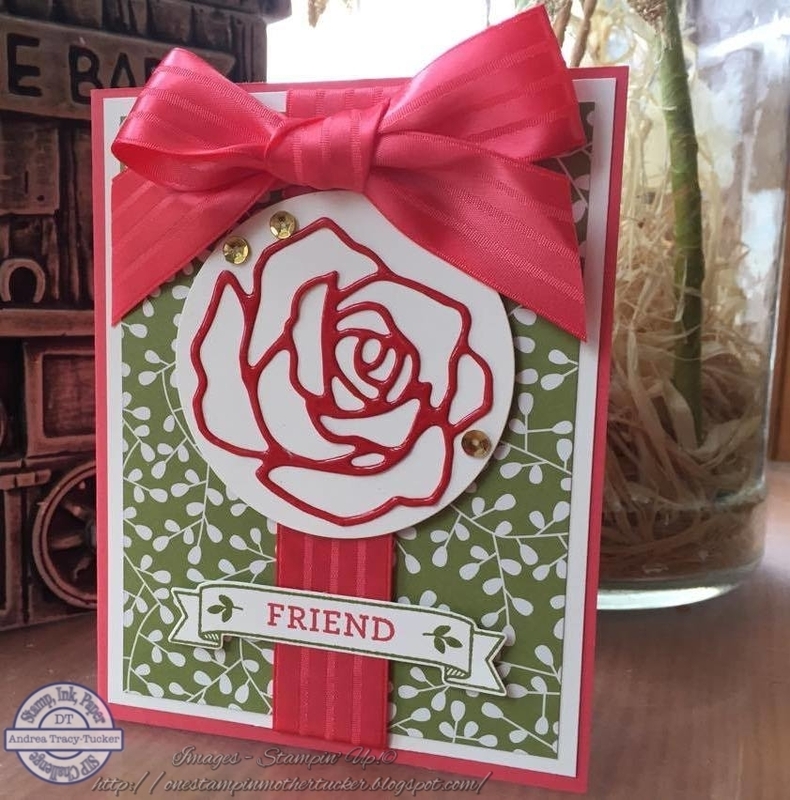 I adhered this to the card using the Stampin' Dimensionals. The sequins are also from our 2016 Occasions catalog. They are in the Love Blossoms Embellishment kit. I used the Fine Tip Glue pen to adhere these sporadically around the rose. For the sentiment I used the photopolymer set Bloomin' Love! I stamped the banner part in Old Olive to coordinate with the DSP and the word Friend was in Watermelon Wonder. This too was adhered with the Stampin' Dimensionals! I hope you love the way my card turned out!!! I can't wait to see what UN-Christmas Card you come up with!! Beautiful card Andrea! Terrific color combo and the ribbon is so rich.